Posted July 2nd, 2015 by Jessica Garcia & filed under Uncategorized. With so many fancy restaurants to choose from in the Hotel Zone, sometimes you just need an escape. Maybe you’d like to feel like a local for a bit. We have some great places where you can eat delicious food at economical prices in local hot spots downtown. 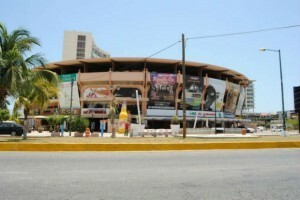 Hosting weekly bullfighting events, Plaza de Toros has many restaurants on the outside of the ring including: Barbacoa De La Tulum, Las De Guanatos and El Pirata Cojo. Located at the heart of all of the action, some of the restaurants feature live music and T.V.’s that show live sporting events. With liter and yard drinks available paired with great tacos and botanas, this place is perfect for a Friday night out. 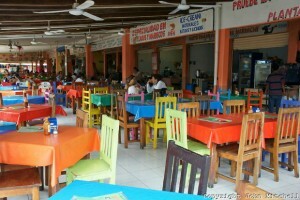 In the heart of downtown Cancun lies Mercado 28, an open-air market full of restaurants and plenty of shops that sell souveniers. With restaurants featuring everything from seafood to tacos it easy to see why locals frequent Mercado 28. Make sure to bring cash and your appetite. 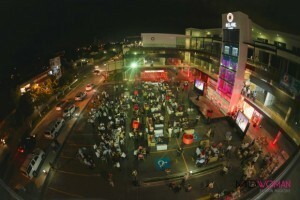 Located across the street from Plaza Las Americas, Plaza Solare is home to chic restaurants and bars such as El Costeñito, The Black Pub and Wings Army. Locals come here to have good food, cold brews and a fun night out with friends. Hidden between the busy street of Tulum and Yaxchilan, Parque de las Palapas is a booming with local food, entertainment and vendors selling handmade crafts and clothing. Named for the roofs that top the carts in the park, locals come here to enjoy authentic, economical foods and snacks. This park offers a playground for kids as well as electronic cars for children to ride all over the park while parents snack on esquites (corn kernels mixed with mayonaise, lime juice, cheese and topped with chili powder) and churros (Mexican fried dough) . This spot is perfect for a Friday, Saturday or Wednesday evening out. 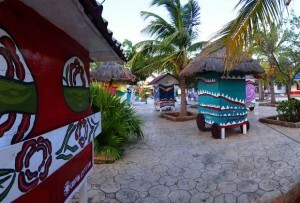 With so many touristy places to visit in Cancun it’s nice to step out of the Hotel Zone and try something different. Not only will you experience local food but the vibrant local culture as well. Can’t wait to start your foodie adventure? Book with us now.